Utrecht has been carefully handcrafting Utrecht Artists' Acrylic Colors in its Brooklyn, New York, mill for more than 50 years. In fact, it was one of the first companies to develop and manufacture artists' acrylics in the world. These fine paints are prized by professional artists for their remarkable brilliance, rich texture, outstanding lightfastness, and excellent longevity. 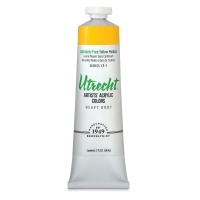 Although they are professional quality, the affordable price of Utrecht Artists' Acrylics makes them a great choice for painters of every level, including beginners and students. They are available in tubes, jars, and gallons for projects of any scale. 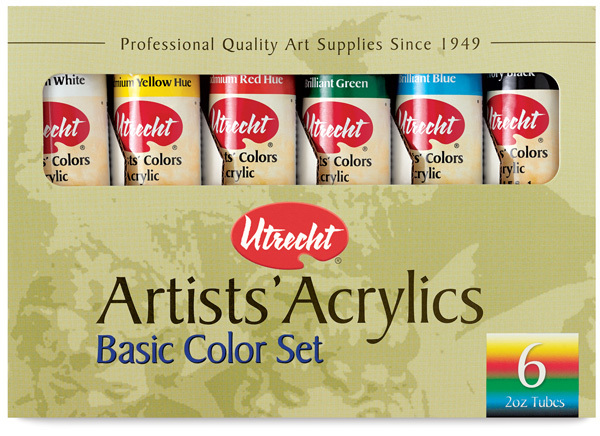 To view a pdf of the Utrecht Artists' Acrylic Colors brochure, please see the Resources Tab. Landscape Set — Based on the preferred colors of well-known landscape painters, this special set of nine colors enables you to capture all the light and weather conditions nature has to offer. It includes 2 oz (59 ml) tubes of Titanium White, Cadmium Yellow Lemon, Yellow Ochre, Quinacridone Red, Venetian Red, Viridian Hue, Ultramarine Blue, Payne's Gray, and Cadmium Green. Portrait Set — The nine colors in this set allow you to achieve excellent flesh tone mixtures in all types of lighting for your portrait and figurative work. It includes 2 oz (59 ml) tubes of Titanium White, Yellow Ochre, Cadmium Red Light, Cadmium Yellow Medium, Chromium Oxide Green, Alizarin Crimson, Burnt Sienna, Ultramarine Blue, and Payne's Gray. Color Theory Set — This fundamental palette of five pure, single pigment primaries allows you to create clean secondary colors, tints, and shades. It includes 2 oz (59 ml) tubes of Titanium White, Hansa Yellow Pale, Quinacridone Red, Phthalo Blue, and Ivory Black, plus a color mixing guide that clarifies the basic principles of color theory. 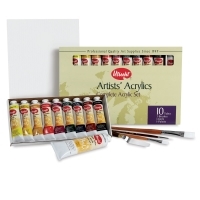 Wood Box Set — This is the quintessential acrylic painting set. It begins with a premium hand-oiled wood box from Jullian of Paris, with softly rounded corners, a sturdy leather handle, heavy duty brass fittings, and aluminum-lined brush trays. Inside the box are 12, 2 oz acrylic colors (Hansa Yellow Light, Cadmium Yellow Light, Viridian Hue, Chromium Oxide Green, Cobalt Blue, Ultramarine Blue, Cadmium Red Light, Quinacridone Red, Yellow Ochre, Burnt Sienna, Burnt Umber, and Payne's Gray), a 5 oz tube of Titanium White, a 5 oz tube of Gloss Acrylic Medium and Varnish, a 2 oz tube of Gel Medium, four Utrecht Series 300 Taklon brushes, a white plastic palette, a double aluminum palette cup, a 3-1/8" trowel-shaped palette knife, and an 8" × 10" canvas panel. The box measures 3"H × 16"W × 12"D.
Basic Color Set — This popular set of six colors provides a basic color palette for the first time painter at an economical price. A longtime favorite of teachers, it's also an excellent limited palette for classroom assignments. 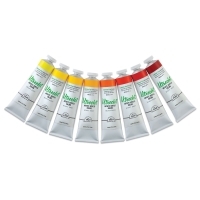 The set includes 2 oz (59 ml) tubes of Titanium White, Cadmium Yellow Hue, Cadmium Red Hue, Brilliant Blue, Brilliant Green, and Ivory Black. Complete Acrylic Set — This set gives you a full spectrum of color, along with a selection of key painting supplies. Included are 2 oz (59 ml) tubes of Cadmium Red Hue, Burnt Sienna, Hansa Yellow Pale, Alizarin Crimson, Phthalo Blue, Phthalo Green, Yellow Ochre, Cadmium Yellow Medium, and Ivory Black, a 5 oz tube of Titanium White, three quality Taklon brushes (Size 8 Flat, Size 4 Flat, and Size 8 Round), a palette knife, and a 9" x 12" paper palette pad. Deluxe Easel Set — This set includes everything in the Wood Box Set described above, plus a lightweight aluminum easel, which holds a canvas up to 54" high. Its telescopic legs are fully adjustable and collapse down to just 26" for tabletop use and easy transport (a black vinyl carry bag is included). Also included are two additional 16" × 20" canvas panels. 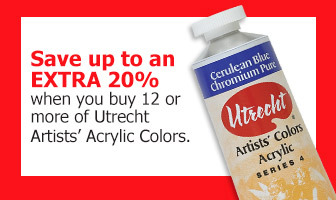 Utrecht Cadmium-Free Artists' Acrylic Colors — Your favorite acrylics are now available cadmium-free. Utrecht Cadmium-Free Acrylic Colors are made with organic single pigment formulas. The eight new colors offer improved color richness, increased brilliance, and consistent color spacing when compared to the cadmium colors, and the color tints either meet or exceed natural cadmium acrylic tints. The cadmium-free colors offer the same excellent performance as cadmium colors, but they're certified non-toxic and safe for your health and the environment. Learn more about the new Cadmium-Free line. To view a PDF of Utrecht Artists' Acrylic Paints, please click here.